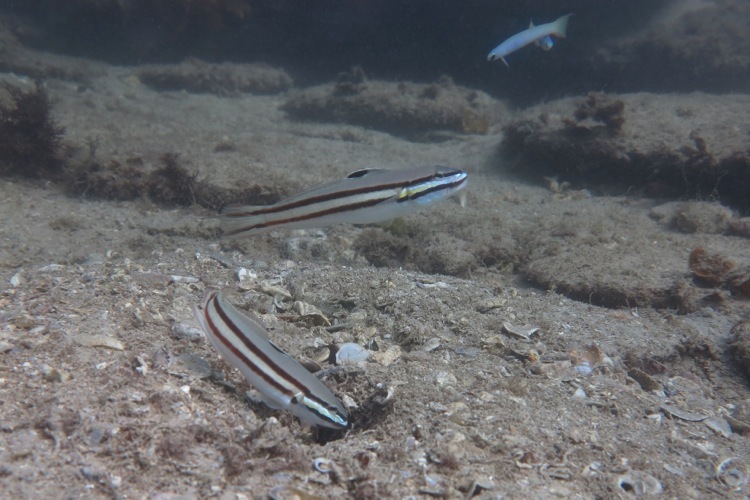 After some weeks away, I went back recently to a site described earlier on this website, where two Black-Lined Sleeper Gobies, (Valenciennea helsdingenii) have been building and tending a network of dens and towers off the coast of Sydney. Here’s a version of the map of their site I drew back in January. On my first return trip this month, it seemed that it was all over at the City. The first tower was just about gone, the second tower much reduced, and there was no sign of the carefully tended holes in the sea floor or the fish themselves. I swam about, silently mumbling misremembered fragments of Shelley’s Ozymandias. 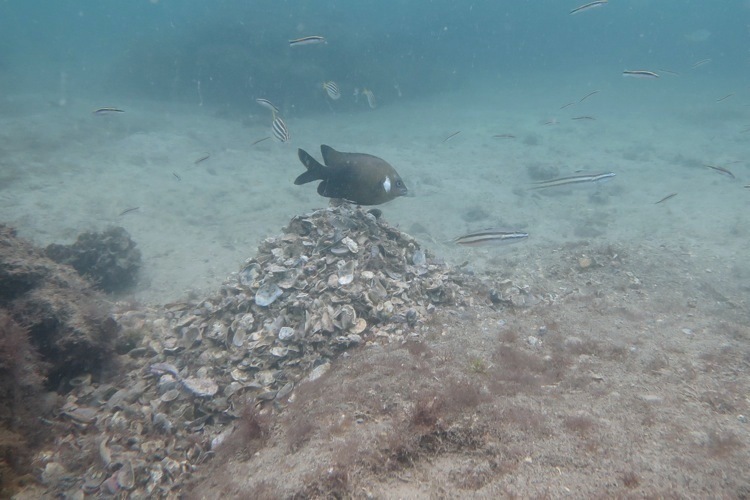 And then, there they were: the fish were at work on a new tower of shells, 2-3 meters WSW of the second one above. This means that, if these are indeed the same fish, they’ve been building and tending the site for over three months now. And here’s something surprising. Back when the fish started building the second tower, in January, I noticed that their site was within the territory of another fish, probably a White-Eared Damselfish, Parma microlepsis. These are just six inches long or so as adults, but very aggressive. They’re the most irritating fish I’ve ever met in the water, in fact, as they are completely fearless, determined to harass anyone in their territory regardless of size, and they’ll bite you if they get the chance. I’ve been bitten by just one, holding a territory near to this site. The bite didn’t break the skin, but there’s something very disconcerting about being bitten by a fish under water. I read that the aggressive individuals are males guarding eggs (yes, males) during the breeding season. The second tower at Sleeper City was, right from the start, within one of these territories. That meant the gobies were frequently chased away from their own building site. They’d flee a little way, then get back to work. At the time I wondered why they persisted in building the second tower in this awkward spot. I assumed that perhaps once they start on a den, they just keep going, even if a site turns out to be a bad choice. There seemed no question that the damselfish was costing the gobies something in time and energy, perhaps also in stress. Given all that, I was very surprised this week to see that the new tower, being constructed beside the ruins of their other efforts, is also in the damselfish’s territory, and it’s still harassing them. Surely, after all the wasted time and effort experienced when building the second tower, they’d want to start their latest building in one of the many parts of their territory where they can work in peace? So there might be nothing much to explain here, except that gobies have a short memory for bad nest sites. But if the damselfish harassment was continual while I was away, and the gobies started the new tower in the face of it, there seem to be two explanations. One is that the gobies have so simple a behavioral program that their choices are unaffected by the presence of costly annoyances like this. They’d be better off building a few meters away (which is all it would take to avoid the trouble) but they don’t realize it. The other alternative is that the gobies are doing something smarter. Perhaps the gobies lose something from being chased around by the damselfish, but gain something too. No one else, including larger and more dangerous animals, has any interest in hanging around in a White-Eared Damselfish’s territory. * Perhaps the gobies are coopting the services of an over-aggressive, but very effective, guard dog. * A relevant exception, at this site, would be Wobbegongs (Carpet Sharks). I guess they’d regard the attack of a damselfish as both charming and appetizing. ** Some astounding close-up and slow-motion video of animals on the Great Barrier Reef has just been posted here. (Thanks to Deep Sea News).